It’s time to begin to focus on how to improve Healthcare.gov. It seems like the government made all the classic rookie mistakes around implementation. They went for the Big Bang. They worked on it for years only to release it at the last second. They brought in tons of vendors and no one really coordinated them. They over paid for the project and didn’t tie anything to performance. They minimized the testing and complexity. I think they’re going to make the same mistake again unfortunately. Fixing it may be harder then starting some of it over. Not the integration but the workflow. Bringing in the A-team and not delaying the penalties won’t be quick. And the new people should be smarter and slow things down so they don’t get thrown under the second bus. 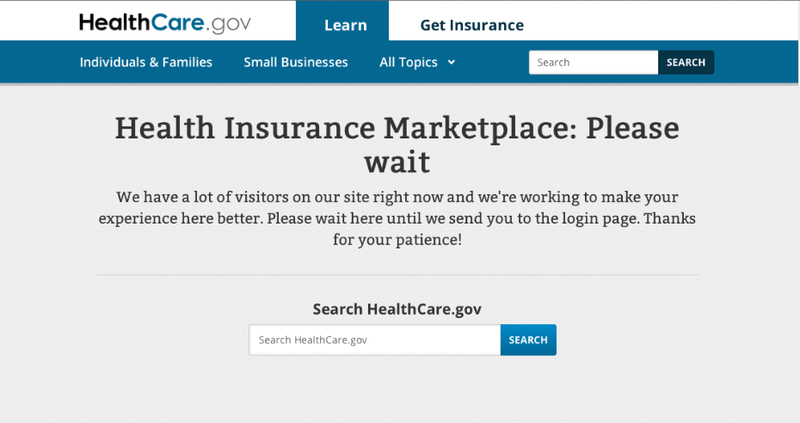 But, this failure shouldn’t doom health reform. They are two different things. Sometimes I think the politicians living in their Disneyland of Washington forget more than they know. The reality is that we have a huge, unsustainable healthcare issue in the US. We should be ashamed to have all the people without coverage that we do. While health reform won’t fix everything, it’s a stepping stone and a lot of the CMS work around innovation, ACOs, and Medicare STARS is critically to payment reform and the shift from FFS to value-based healthcare. There is still a ton of work to be done. We haven’t addressed health literacy. We haven’t addressed quality. The overall experience is still disconnected and generally poor. The politicians need to focus on making our country better not playing games (on both sides). And, while I disagree with the tactic, the Republican play to focus on the budget was important. We can’t bankrupt this country for our kids. While the government villianizes the Private Equity industry that leverages up companies and takes on debt risks that’s exactly what the government is doing now. 1. The healthcare experience. While this is the third leg of the Triple Aim, it often seems like the one that is so hard for healthcare companies to get. The system is so fragmented that the patient often is forgotten. 3. Intelligent phones. This is something that people carry everywhere. They often live life through the phone sometimes missing out on reality. The phone has tons of data as I’ve described before. We have to figure out how to tap into this in a less disruptive way. 5. Benefits selection. I’ve picked the wrong benefits a few times. This drives me crazy. As I mentioned the other day, the technology to help with this exists and all the data which sits in EMRs and PHRs should allow us to fix this problem. 6. The role of retail pharmacy. This is one of my favorite topics. With more retail pharmacies than McDonalds and a huge problem of access, pharmacies could be the key turning point in influencing change in this country. 7. Caregiver empowerment. Anyone who cares for an adult and/or child knows how hard it is to be a caregiver and take care of their own needs. This becomes even harder with the people being geographically apart. With all the sensors and remote technology out there, I see this being a hot space in the next decade. 8. The smart house. As an architect, I’ve always dreamed of helping create the intelligent house where it knows what food you have. It manages your heat and light. It tracks your movements and could call for help if you fall. I see this being an opportunity to empower seniors to live at home longer. 9. Helping the disenfranchised. For years, we’ve all seen data showing that income can affect health. The question is how will we fix this. Coverage for all is certainly a critical step but that won’t fix it. We have a huge health literacy issue also. Ultimately, public health needs a program like we had to get people to wear seat belts. We need yo own our fate and change it before we end up like the humans in the movie Wall-e.
10. A Hispanic healthcare company in the US. With 16% of the US that speak Spanish, I’m shocked that I haven’t seen someone come out with a health and wellness company that is Hispanic centric in terms of the approach to improving care, engaging consumers, and providing support. So, what would you like to solve? The idea of healthcare costs and the need for healthcare transparency has become a front page issue. With the shift to consumer driven healthcare and high deductible plans, the average consumer is increasingly aware of what things cost. And companies like Change Healthcare provide tools to help consumers navigate this maze. But, what I don’t hear many people discuss is the issue of middlemen and how this adds cost to the system. I’ve worked for several middlemen so I think I understand the model well. Of course, these companies make good (and true) arguments which is that they lower costs due to scale based efficiencies. But, healthcare is big business so everyone has to get paid somehow. Some of the “non-profits” make the most money. – This begins with the manufacturer who adds the marketing and sales costs to the actual ingredient and packaging and shipping costs. – The drug is then shipped to a wholesaler who stocks the drugs and ships them to pharmacies. – The drugs are then sold by the pharmacy to the consumer and the pharmacy bills the payer. – Assuming the payer isn’t the actual employer, the payer will then bill the employer. Still wonder why healthcare is expensive? I wish I had an easy answer. A lot of these services are needed and it would cost more if the employers all had to do this themselves. There would be no scale. There would be no efficiencies. This is certainly one argument for the efficiencies of a single payer system but I don’t think that’s very efficient IMHO. I think this is true for both Wall Street along with prospective employees. I think both would love to have a report card on the prevalence of prescription drug use within a company? – Is there an abnormally high use of anti-depressants? – Is there an abnormally high use of sleep medications? – Is there an abnormally high use of anti-virals associated with STDs? All of these might indicate cultural problems which would be early indicators of turnover or other issues. On the flipside, there might be other health data points that provide additional data. – What is the average step count for the population? – What percentage of the population play sports? – How many people have metabolic syndrome? – How many hours do people sleep? – Are there treadmill desks and other tools to support good health? – What percentage of people eat lunch by themselves or at their desk or in a meeting? – What percentage of people call the EAP line? What other health data points would you want? I talked about my experience trying to use the site day one. I honestly hoped it was an anomaly but it doesn’t seem to be. 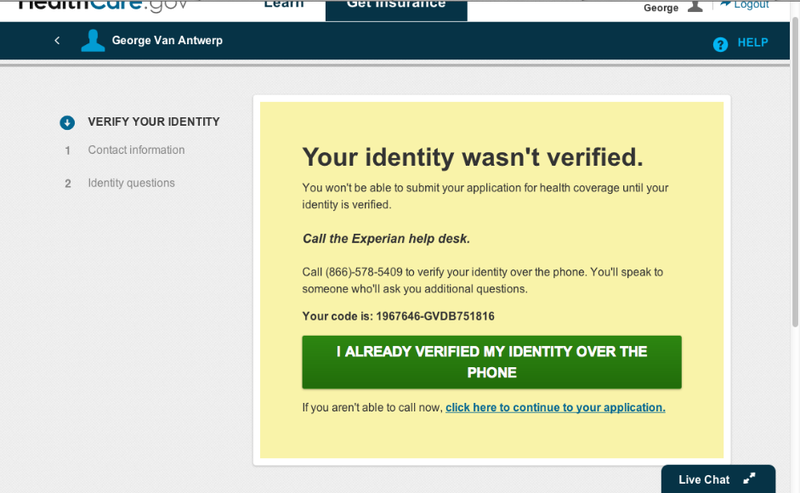 But, as I think about Healthcare.gov and the general benefits selection process, I see two huge gaps. Back in 1999, I was working with a company called Firepond. The had what was called a product configurator. At the time, I was at E&Y and Empire BCBS and several other Blues hired them to build a tool for brokers. The tool sat behind a really slick web interface which allowed the broker to ask a consumer less than 10 questions. They would move a sliding bar across the screen and it would dynamically rank their plan options to tell them what was the best option for them to buy. It seems like that wold be great for Medicare.gov and Healthcare.gov. What we were missing then which Big Data might actually help us solve now is individual claims data. This is what drives me crazy when you have to pick your benefits at work. Why can’t I upload my benefits information and have a tool actually tell me what to buy? If I had my claims history plus a predictive model, I could make smarter decisions about how to select my benefits. Prime Therapeutics is a PBM owned by the Blues. Several years ago, they insourced their specialty pharmacy operations from Walgreens. This has been part of their transformation which was a result of new leadership under Eric Elliott who used to run Cigna’s PBM. As a PBM that’s owned by the Blues, I’ve talked about them before as an interesting cross of a standalone PBM (ala Express Scripts) and an integrated PBM (ala Humana Rightsource). As everyone in the industry knows, the shift in pharmacy has moved from innovator drugs in the traditional space to innovation in the specialty or biopharmaceutical space. This includes both branded products and biosimilars. This is critical path for employers, payers, and PBMs. A traditional strategy of promoting generic drugs and mail order or preferred pharmacies just doesn’t cut it anymore. Although specialty drugs are still only used by about 1% of the population, they are the fastest growing area in healthcare. According to Prime Therapeutics Drug Trend Report, their clients saw a 19% increase in specialty spending last year. And, specialty drugs now account for over 30% of all the drug spend. If you look at the drug pipeline, this is going to continue to explode. I just met with a series of specialty pharmacies to discuss their offerings and strategies. There are several drugs coming that claim to “cure” some of these specialty conditions are at least meaningfully impact the patient outcomes in ways that weren’t even envisioned years ago. And, I think we all know that’s not going to come cheap! A copy of the specialty report is now available on Prime’s website and short videos about each of the seven steps can be found on Prime’s You Tube channel. This new report is the first specialty-focused report published by Prime. It follows Prime’s 2013 Drug Trend Insights infographic released in May. Visit the Industry Insights of Prime’s website for more drug trend information. With that in mind, I find the announcements by Walgreens and CVS very interesting. “Providing information about new health insurance coverage opportunities is in keeping with our purpose of helping people on their path to better health,” said Helena Foulkes, Executive Vice President and Chief Health Care Strategy and Marketing Officer for CVS Caremark. “We are pleased to combine our innovative suite of services and our new and existing relationships with organizations such as Humana to help patients understand and have access to information about insurance options in their community. Walgreens store personnel are directing individual customers who inquire to the GoHealth Marketplace, a resource where they can shop and compare health insurance plans, enroll and find other important tools and information. Consumers can access the GoHealth Marketplace online from www.walgreens.com/healthcarereform or via phone at 855-487-6969. Walgreens also is providing informational brochures and other materials in stores. In both cases, they may have addressed one of my questions about this strategy from my presentation which was how would they monetize this. I think it’s the right role, but I wasn’t sure how it would lead to revenue other than general revenue related to store traffic. I assume both of these have some “commission” or “referral fee” for traffic generated. Given all the buzz about healthcare exchanges (much of it echoing what I talked about last week), I thought this was an interesting study from Coupa Software. 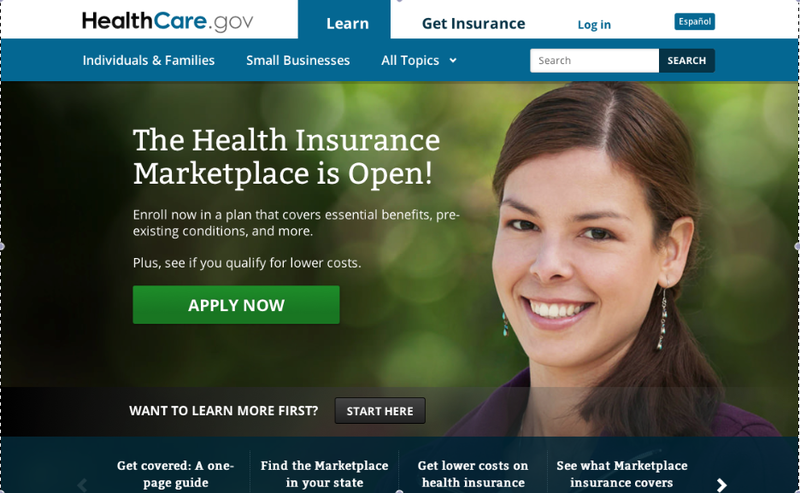 I was up and ready to try the new healthcare exchanges at HealthCare.gov this morning. While it started well with a nice GUI (graphic user interface), it went downhill from there. Once I got in, it was busy so I had to hold. Then, when I tried to create a username and followed the directions, it wouldn’t accept my username. And, finally, when I got through it all, it wouldn’t accept who I was to let me proceed. If everyone else has a similar experience, this is either going to be a miserable failure or the call centers are going to be lit up with phone calls and huge waits. I guess to answer the question that the CEO of BCBS of NC poised the other day…this won’t reflect badly on the plans because I can’t even get far enough into the process to see what plans participate. The one positive (other than the design) was that the terms and conditions were ridiculously simple!